Update your casual look with these Rocket Dog Jazzin Ladies Canvas Trainers. 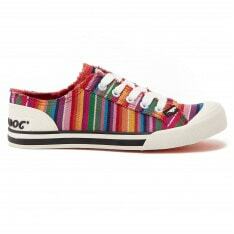 They are perfect for everyday wear thanks to the combination of a lightweight canvas upper, and a cushioned midsole. The off-duty look is completed in a printed design with Rocket Dog branding.